Please enter your Username or Contact E-mail address in the fields below and click Submit to continue. If the information matches our records, a new password will be sent to your Contact E-mail address. 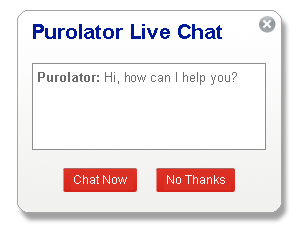 If you have changed your Contact E-mail address recently, please call our toll free number (1 800 459-5599) to speak with a Purolator representative.